The eagerly awaited fifth installment of Tasmania’s own Soundscape Festival 2012 has been announced to take place over two huge days Fri 16th and Sat 17th of Nov at their new home - PW1 (Princes Wharf Shed No. 1, Castray Esplanade - just off Salamanca Place). Tasmanian music fans have become accustomed to a January Soundscape however organizers made the decision to postpone the 2012 event from January to its new home in November for a number of reasons. Celebrating its 5th birthday by going boutique, a reduced capacity means patrons will enjoy less queuing for food, drinks, toilets and enjoy a more intimate experience with the performers. It is all about the experience and making the most of a fabulous, central, waterside location. With two evenings of fabulous music, food and entertainment, festival goers get to enjoy it all at an affordable price and still sleep in a comfortable bed. And what a line-up it is. 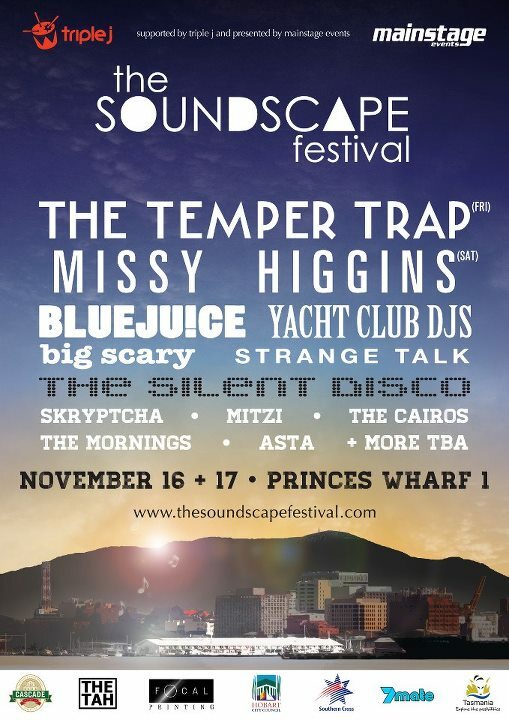 Soundscape 2012 is proud to announce that this year’s line-up will feature; Temper Trap, Missy Higgins, Bluejuice, Yacht Club DJ’s, Big Scary, Strange Talk, Scryptcha, Mitzi, The Cairos, The Mornings, Asta and heaps more yet to be announced.